← To the barricades! No, the other barricades. My title, a line from Monty Python and the Holy Grail, came to mind during recent reflections on independent bookstores. I used to go to bookstores to make discoveries. The best were quirky, and I loved to be surprised and find something new to read. My all time favorite was a sci-fi/fantasy specialty store in a low rent strip mall. The store was a labor of love for the owner, who made most of his income trading collectables – signed Robert Heinlein first editions and vintage comic books. I could walk in and say, “I’m looking for urban fantasy that centers on spirit guides,” or, “I’m in the mood for a quest – got anything that’s not a dumb Tolkien ripoff?” Most of the time, I’d find what I was looking for and have an interesting chat on trends in the genre with someone who was steeped in that world. You never know what you’re going to find in a place like that. Sadly, independents are on the ropes, but as the Pythons put it, they’re not dead yet. Here is a link to indiebound.org, which has a tab at the top right to locate independent booksellers. We don’t even have to abandon ebooks to shop at indies! In February, 2012, I wrote about The Book Seller, a great independent shop in Grass Valley, that encourages ebook fans to order through their website; that way they get a commission on each sale (the format is .epub, the standard all-but-Amazon format, which can be read on a Nook or any laptop, smartphone, or tablet using the free Nook app). I’m pretty sure that for just about everyone reading this blog, books are a huge and treasured part of our lives. If anything good has come out of the Amazon-Hachette dispute, it’s information like this which can help me rethink the way I buy books. As Mark Coker put it, the ideal is “a vibrant ecosystem of multiple competing retailers.” It’s good to know what I can do to help secure such a future. This entry was posted in Books, Publishing, Writing and tagged 2014, books, Culture, ebooks, epub, Independent bookstores, Nook, postaweek2014, publishing, The Book Seller. Bookmark the permalink. Indy (from I’m Not Dead Yet) is a great acronym to apply to indie bookshops (as bookstores are known in the UK — but you knew that). If my memory serves me well it was also the nickname given to a gene controlling the length of fruit flies’ lives. Great catch – I missed it and will add that acronym as a footnote to the post. Thanks, Morgan. I don’t usually buy ebooks, but if I do I will keep this in mind. I also appreciate the link to indiebound. I’m with you. 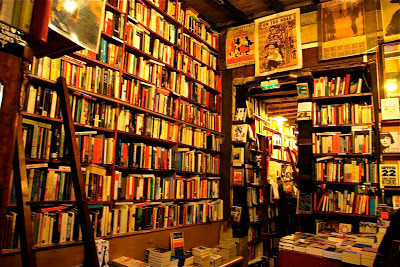 It breaks my heart that in this era, that has seen a swell of authors, small book stores are few and far between. It never occurred to me that it would be possible to live in a town without a bookstore. But here I am. Carson City lost Borders four years ago, and has never had a small indie bookstore. Some of my most cherished book related memories are of the hours I spent in Tree Horn books in Santa Rosa. Like you, I could ask for something vague and come out with exactly want I wanted. The rise in online bookstores is not progress I applaud. I’m really sorry to hear there are no small bookstores in Carson City. It’s not just books, of course – all you see of a lot of places these days are the same big box stores that line the freeway as you zip past. Sadly, Borders was one of the nicer big box stores. Your experience reminds me of a post in Nov. 2011 (http://wp.me/pYql4-1qW), after reading that author, Ann Patchett, opened her own indie bookstore in Nashville after the Borders folded. Of course it helped that as a best selling author, she could arrange financing as well as have some time to pour into the effort, to say nothing of bringing in other popular writers to give readings, or getting a spot on the Colbert Report. I keep hearing little whispers that independent bookstores are on the rebound. I certainly hope so!